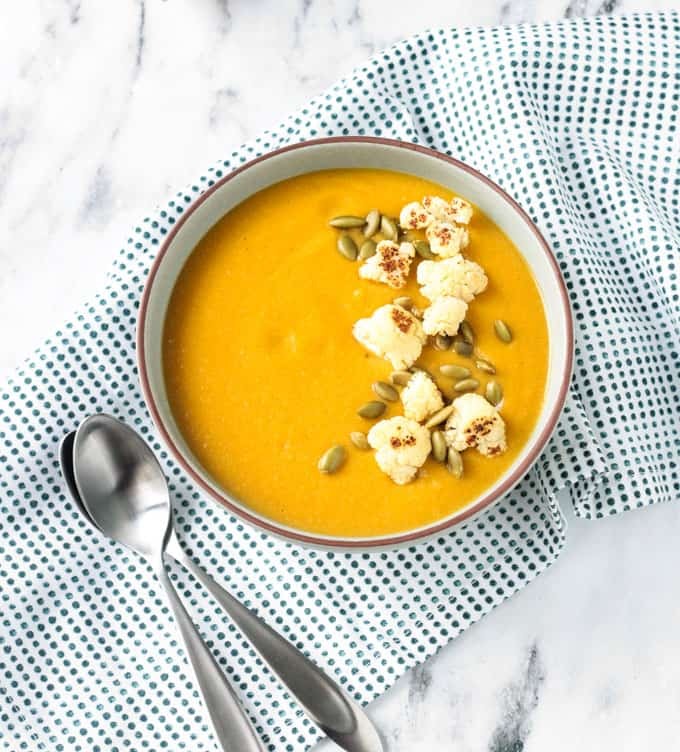 Sweet Potato Cauliflower Soup – a creamy vegan soup made with whole food ingredients and minimal fuss to let the vegetables shine. Perfect for a weeknight. I’m all about soup these days. As soon as the weather turns cooler, we eat soup at least twice a week, if not more. You guys know I love soup – all kinds and all year round. But fall and winter is when I really start thinking about soup every day. It’s just so warming and comforting. It’s easy to double up to feed a crowd. Serve it with a hunk of crusty bread and you’ve got a complete meal. 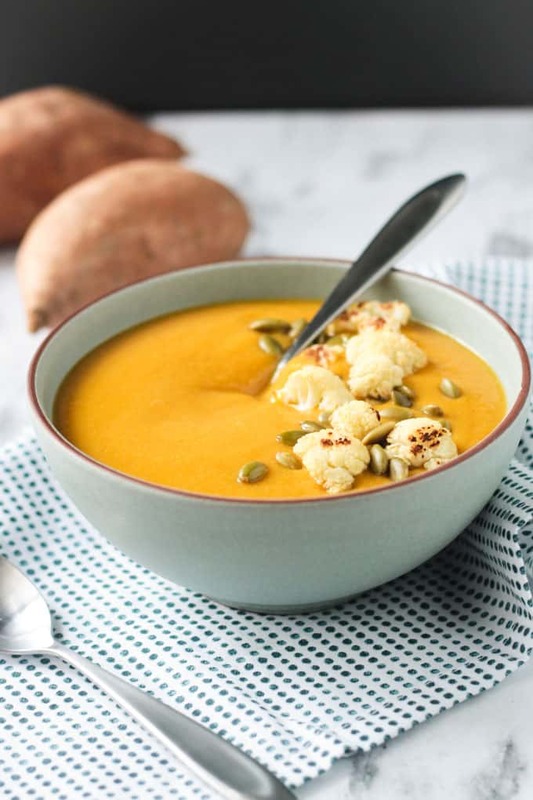 This vegan soup – Sweet Potato Cauliflower – was a hit with even the kids. It’s creamy, sweet, earthy, delicious! 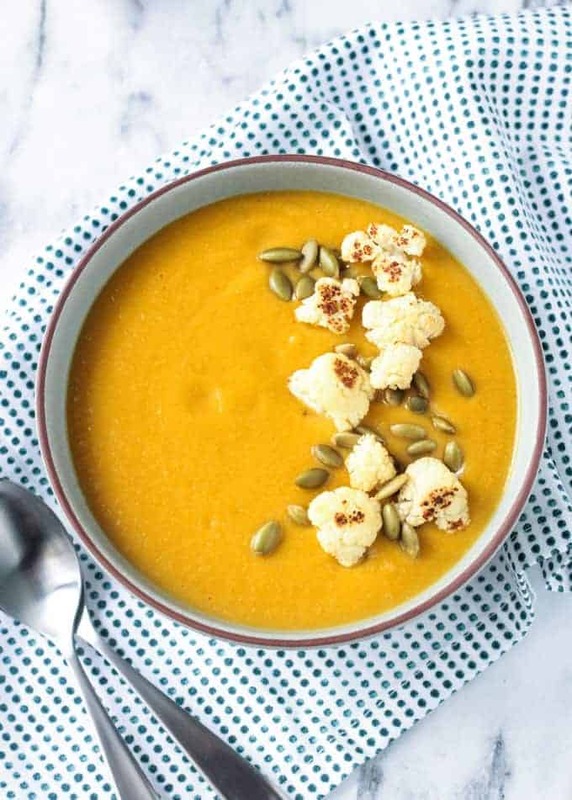 Made with whole food ingredients, this cauliflower soup is nutritious and healthy. Cauliflower is a cruciferous vegetable, like broccoli, cabbage, and kale, all known for their potential cancer-fighting abilities. This white veggie is incredibly high in vitamin C and also contains good amounts of vitamin K, fiber, folate, choline, B vitamins, healthy omega-3 fats, phosphorus, potassium, and many more! Sweet potatoes have huge amounts of vitamin A and is also very high in vitamin C, manganese, copper, B vitamins, potassium, fiber, and more! 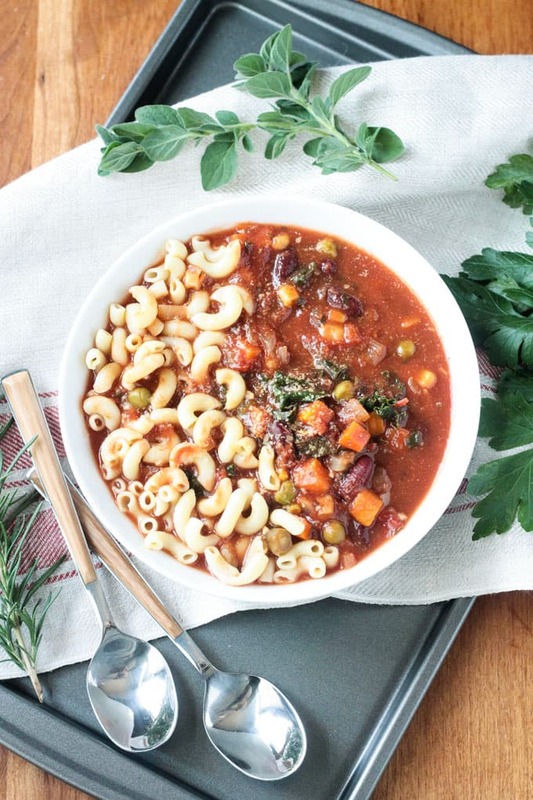 This vegan soup has antioxidants and anti-inflammatory properties. So grab a spoon and cozy up to a big bowl. Healthy food is great, but if it doesn’t taste good, what’s the point? Good thing this vegan cauliflower soup tastes just as amazing as it’s nutritional profile. The sweetness from the sweet potatoes, the earthiness from the cauliflower, the richness form the coconut milk, and a few spices to bring it all together. The kids love it too! They like to dunk hearty slices of bread into it. One day I tried it with a little roasted broccoli thrown on top too because we had some leftover – and that was also delicious. Bonus, it’s so easy to make! It comes together in just over 30 minutes, making it perfect for a weeknight. I hope you love this Cauliflower Soup as much as we do. If you try it, please come back and leave me a comment below with your feedback and star rating. You can also find me on social media. Be sure to tag @veggie_inspired and #veggieinspired so I’m sure to see it. Enjoy! 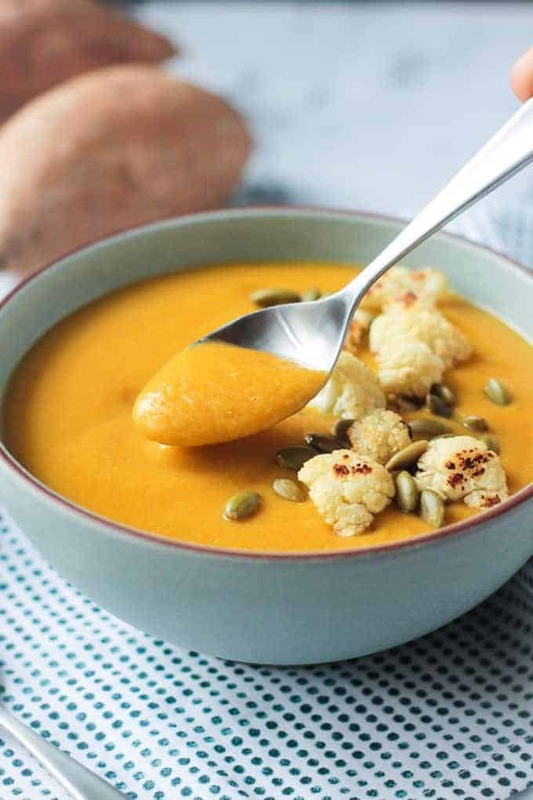 Sweet Potato Cauliflower Soup - a creamy vegan soup made with whole food ingredients and minimal fuss to let the vegetables shine. Perfect for a weeknight. Preheat oven to 400 degrees F. Take 1 cup of the cauliflower and spread onto a baking sheet. Drizzle the 1 tsp of olive oil (if using) and a sprinkle of salt over the cauliflower and mix well. Spread the cauliflower out into one even layer and bake for 20 minutes. Shake the pan to toss the cauliflower around and bake another 5-10 minutes until the edges start to turn brown. In the meantime, in a soup pot over medium heat, sauté the diced onion in 1/4 cup vegetable broth until translucent - about 7-8 minutes. Add more vegetable broth as needed so the onions don't stick. Add the garlic, sage, paprika, and turmeric, and sauté 1 minute. Add the chopped sweet potato, cauliflower, and remaining vegetable broth. Bring to a boil, then turn down heat to med-low and simmer for 20 minutes until the vegetable are fork tender. Using an immersion blender, purée the soup until smooth and creamy. (Alternately, you can carefully transfer the soup to a blender to purée.) Add the coconut milk and stir well. Taste and adjust seasonings, adding salt and pepper, if necessary. If you like a thinner soup, add a bit more vegetable broth or water. Serve in individual bowls garnished with a few roasted cauliflower florets. 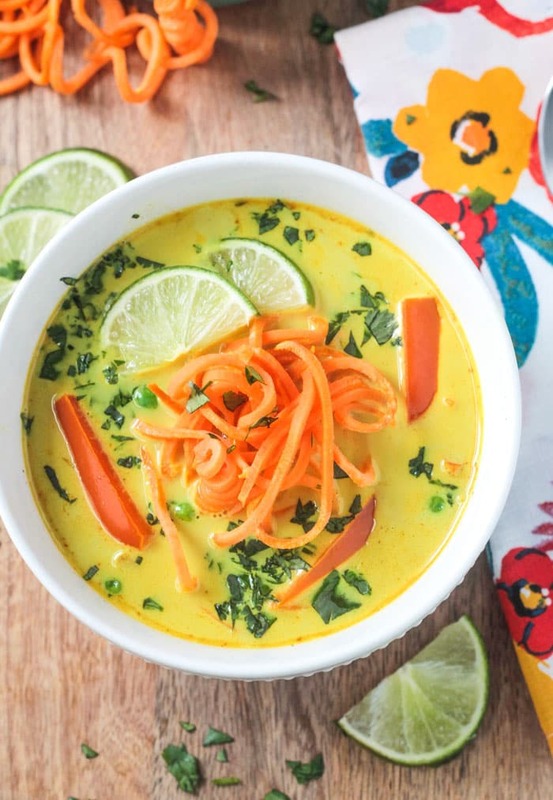 *I like using light coconut milk in this recipe because it's very creamy without the strong coconut flavor that full fat coconut milk has. Cashew milk would work nicely too. Fabulous recipe, thank you. Instead of the sage I added a teaspoon of curry powder. The soup now as delicious! Thank you, Deborah! I’m so happy you loved it. Curry powder sounds like a delicious addition! I have made this several times. Today, I varied it subbing out the veg broth for the TJ’s Ginger Miso broth. Also delicious! I’m so glad you like it, Sara! I see that Ginger Miso broth all the time, but have never bought it. Guess I need to try it! Sounds like a great substitution! Thanks for your comment! Made a double batch for a vegan potluck/solstice celebration, and it was a hit. A dozen people ate all but two cups of it. I used regular coconut milk but only half what the recipe called for, and we agreed that worked. The ten-minute prep time is overly optimistic, but prep is pretty easy. It just takes me longer than 10 minutes to peel cut and dice that many vegetables. I’d say my prep time was 30-40 minutes. If, like me, you don’t have an immersion blender, be sure to cool the soup before putting it in a regular blender or you may melt crucial parts on your blender. I divided it into four bowls and then went to take a nap for 30 minutes. So glad everyone loved it, Mary! I guess I’ve gotten pretty good at chopping vegetables. I can definitely do it all in 10 minutes. If it takes you longer to chop, you can always buy the store bought pre-chopped veggies – no shame in that game, although they do cost a bit more. And, OMG, about your blender?! What kind of blender do you have? Scary! A+! Great tasty creamy recipe. I added some lemon and nutritional yeast (staple vegan item) and it’s super tasty. Taking it over to my sick mum now 🙂 Thanks! Sorry to hear your mom is sick, Kat. I hope this soup helps to make her feel better. You’re such a sweet daughter! So glad you liked the soup! Oh, that’s so awesome to hear, Steph! Happy you both loved it! Thank you! I loved this recipe! I did use regular coconut milk since I didn’t have mild on hand and it was still great! Add a bit extra garlic and onion seasoning + sea salt and cracked pepper paired with whole wheat crackers and my soul was just happy! Following this recipe, gives me a large enough portion that I’ll be eating off of for a few days! Thank you for sharing!!! That’s great, Destiny! I’m so happy you loved it! HaHa, love it!! Thank you, Sabine! Could you make this recipe in a crockpot? I’m sure you could, though as I haven’t tried it, I hesitate to give specific instructions. It’s Lent, so vegan soups are my mainstay meal 🙂 I’ve been watching my caloric intake too, so could you please include how much is in a “serving” ? One cup, two cups, etc. Thanks so much. The recipe sounds wonderful and I’m thinking of making it for our church Soup Supper after Stations of the Cross this Friday. Hi, Margi. A serving would be about 2 cups…but that’s just an estimate. So Delicious coconut milk will definitely be thinner. 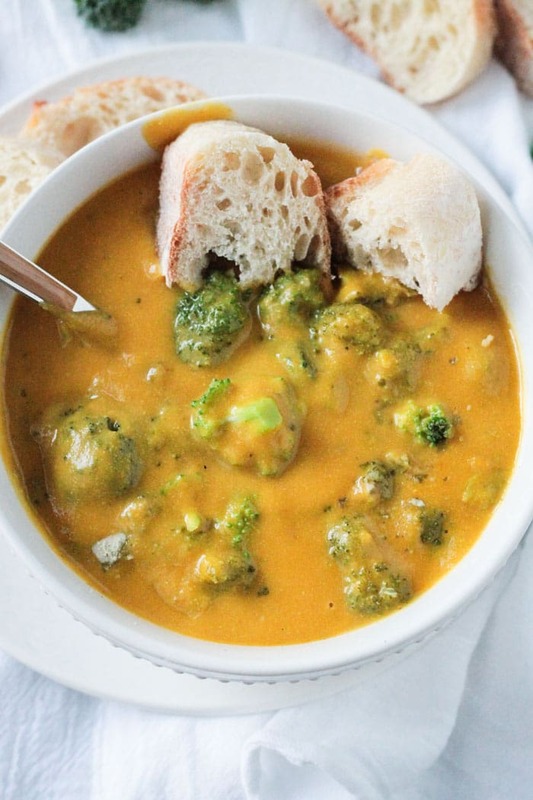 Maybe start with 1/4 – 1/2 cup less vegetable broth if you are using the So Delicious coconut milk. You can always add more broth later to thin if needed. Enjoy! This soup sounds so good Jennifer. I love how you added cauliflower. I bet that not only adds some extra flavor and nutritional value but also that extra creaminess. Thanks, Nicole! Yes, it is super creamy! I hope you love it! This looks really good. Can’t wait to give it a try for Saturday’s dinner. Thanks so much. Thanks, Diane! Let me know how it turns out. Enjoy! What a lovely soup recipe. The sage & turmeric combo is great. I eat soup a lot too, all year, but more so in fall and winter. I love it, plus it gives me an excuse to eat more bread which I also love! Any excuse to eat a hunk of crusty bread is a good one!! Thanks, Mel! This is so cozy and perfect for fall!!! Made this tonight and it was amazing! I never would have combined sage with turmeric and paprika – a lovely combination as was the cauliflower and sweet potato. The coconut milk was a little “rich” so I may try next time with almond milk. Thank you for a new favorite soup for me! Hi, Karen! I’m so happy to hear you loved it! Any dairy free milk should do the trick. Thank you so much stopping by to leave this great comment. Enjoy your week! Real talk – Cream of cauliflower soup is my all-time favorite comfort soup. But THIS soup looks like a contender to beat out my favorite! I can’t wait to try it! YUM!! I love that kind of real talk! 🙂 I hope you love it, Christina. Thank you! Let me know if you give it a try. What a delicious soup! I love the bits of cauliflower on top to give it a nice texture with the smooth soup. Great flavors! Thanks, Amy! Even though I love silky smooth soups, I still like a little texture with the garnish! This looks so creamy and delicious! I’ve been loving cauliflower lately! Cauliflower is my fave! I just bought another large on at the store today! Yay!